Using an innovative crystallization technique for studying three-dimensional structures of gene transcription machinery, an international team of researchers, led by scientists at Penn State, has revealed new insights into the long debated action of the "magic spot"–a molecule that controls gene expression in Eschericahia coli and many other bacteria when the bacteria are stressed. The study contributes to our fundamental understanding of how bacteria adapt and survive under adverse conditions and provides clues about key processes that could be targeted in the search for new antibiotics. A paper describing the research appears on February 22, 2018 in the journal Molecular Cell. "When bacteria experience stress, such as starvation, they remodel their gene expression," said Katsuhiko Murakami, professor of biochemistry and molecular biology at Penn State and an author of the paper. "In 1969, our coauthor, Michael Cashel, discovered that a new molecule appeared in E. coli when the bacteria were starved of key nutrients. Cashel called this molecule, which showed up as a new spot on a chromatogram, the 'magic spot,' because of its appearance from seemingly nowhere when bacteria were starved." The magic spot subsequently was shown to be guanosine tetraphosphate, or ppGpp, a chemically modified analog of the G nucleotide in the ATCG alphabet of the genome. Its appearance following starvation and other stresses is associated with changes in the expression of over 500 genes, most prominently genes for the structural RNAs that are components of the ribosome– the enzyme responsible for protein synthesis. The ppGpp molecule interacts with E. coli's RNA polymerase–the cellular machine that produces RNA from genomic DNA–but precisely how this interaction controls gene expression remains a mystery. The new X-ray crystal structures, however, provide clues to this process by showing for the first time three-dimensional images of E. coli RNA polymerase in complex with ppGpp and another important factor that works with ppGpp, DksA. The three-dimensional structure of RNA polymerase is well established, but seeing the structure of RNA polymerase while it is interacting with other molecules has proved to be technically difficult. The interacting molecules often disassociate during the crystallization process necessary to see their structure. The researchers overcame this difficulty by adding molecules of DksA and ppGpp to RNA polymerase that had been crystalized independently. "We first created crystals of RNA polymerase, then soaked in DksA and ppGpp," said Vadim Molodtsov, assistant research professor in biochemistry and molecular biology at Penn State and another author of the paper. 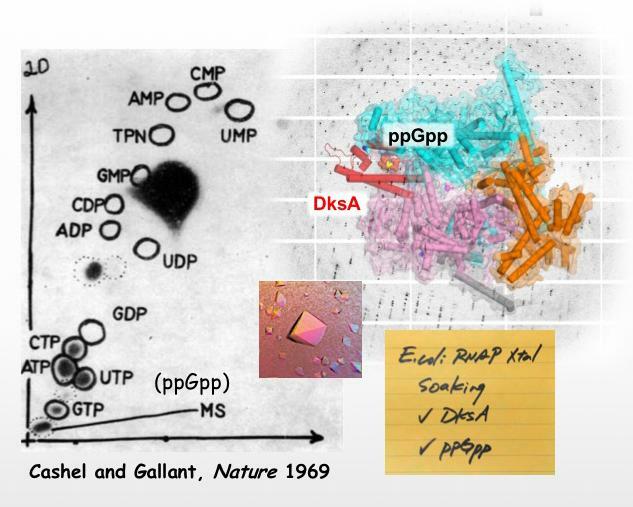 "When we did this, we saw that ppGpp bound to the complex of RNA polymerase and DksA in a way that changed the interaction between RNA polymerase and DksA. We think this change could be key to explain how ppGpp alters transcription so that the bacteria can respond to stress." RNA polymerase in bacteria controls the expression of all genes, but in response to the presence of ppGpp, the expression levels of some genes are turned down, while many are unaffected and some are turned up. These changes in expression levels allow the bacteria to alter their composition to better survive stress. The researchers speculate that the different responses may be due to individual differences in the promotors–DNA sequences near the beginnings of genes that initiate expression–of individual genes. "We are full of bacteria," said Sarah Ades, associate professor of biochemistry and molecular biology at Penn State and an author of the paper. "They affect our mood, they affect our weight, they affect our immune systems. The ppGpp system is important in lots of these bacteria, allowing them to sense their environment and adjust to stress. Understanding how ppGpp functions will allow us to better understand these bacteria and how they affect us. The system is also important in bacterial pathogens that cause infectious disease. Understanding how ppGpp works could allow us to find ways to disrupt its functions and develop new antibiotics." In addition to Murakami, Molodtsov, and Ades, the research team includes Elena Sineva at Penn State, Lu Zhang and Xuhui Huang at the the Hong Kong University of Science and Technology, Kowloon, Hong Kong; and Michael Cashel at the U.S. National Institutes of Health (NIH). The research was supported by the NIH, the Hong Kong Research Grants Counsel, and the Intramural Research Program of the NIH.